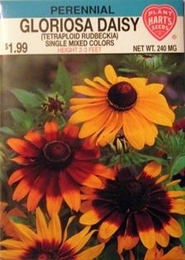 Gloriosa Daisy - Single Mixed Colors, Tetraploid rudbeckia. This perennial will bloom the first year if started in early spring. A tetraploid version of the familiar Rudbeckia mixture that results in extremely large blooms up to 5 inches across in various combinations of gold and red. Gloriosa Daisy will flower all summer when planted in full sun. Plant in garden where they will bloom year after year. Thinning - when plants are 2-3 inches tall thin to 12-15 inches apart.